RESIDENTS OF DURSEY Island off the coast of West Cork were left stranded last weekend, after the cable car that links them to the mainland unexpectedly ceased running on Friday evening and didn’t start again until Monday morning. Speaking to Patricia Messenger on C103′s Cork Today, a local resident named Martin detailed how the islanders are angry at the council for not ensuring that there was a service on a weekend so close to Christmas. 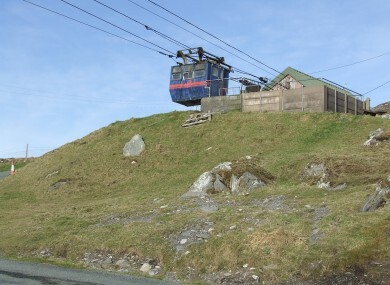 According to the cable car’s website, the Dursey island service is meant to run at least three times a day on both Saturday and Sunday during the winter and spring months. The cable car is run by Cork County Council. According to CSO figures, there are less than 10 permanent residents on the island. “The man that operates the cable car full time gave notice to Cork County Council that he was taking the weekend off,” Martin said. The cable car finished at half five on Friday evening and didn’t start again until half nine on Monday morning. Suspending the service was bad enough, but the lack of notification given to residents was a lot worse, according to Martin. “Only a few of us were told, and it was on the Friday that it was shutting down,” he said. While there is a full-time operator, there are also three relief cable-car operators. When Martin inquired as to why none of those were available, he was repeatedly told: “There’s nobody to operate it this weekend”. Notices were put up on the cable car station informing the public that the cable car would be closed on Saturday and Sunday and e-mails were sent to elected representatives, accommodation providers, tourism bodies and those islanders with an e-mail address with the same message. The spokesperson added that the service operated during the months of June, July, August and September. Email “West Cork islanders left stranded for two days after cable car service was suspended”. Feedback on “West Cork islanders left stranded for two days after cable car service was suspended”.